Novel Cell Penetrating Peptide PEG nonviral gene delivery reagents were launched in May 2018 via the “Novel Cell-Penetrating Drug Delivery System for siRNA” poster that was presented by JenKem Technology and Tianjin Medical University at the 2018 TIDES meeting . Experience has shown that siRNA drugs, while potentially very useful, are easily degraded by nucleases in vivo, and their relatively high molecular weight, negative charge and hydrophilicity inhibit their ability to permeate through cell membranes [2, 3]. To circumvent these deficiencies, a novel drug delivery system consisting of a cell penetrating peptide (LMWP) linked to activated PEGs (polyethylene glycol polymers) has been developed for siRNA delivery. The addition of the PEG improves the drug’s bioavailability by preventing the self-assembly and formation of intra-molecular hairpin structures between the cell penetrating peptide and siRNA . In vitro studies confirm successful cellular uptake of siRNA and high gene-silencing efficacy using this novel cell penetrating peptide-PEG drug delivery system. LMWP-PEG was first conjugated with FITC labeled anti-EGFP siRNA. 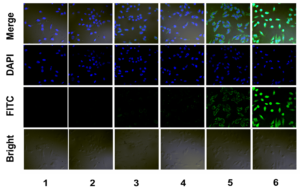 Cell uptake studies for LMWP-PEG-RNA conjugate with anti-EGFP siRNA were carried out on MDA-MB-231 cells using a confocal microscope. 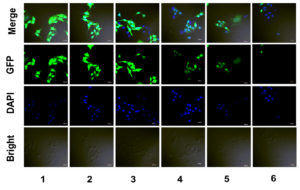 The gene silencing down-regulating effect by anti-EGFP siRNA was assessed by laser scanning microscopy using EGFP over-expressed MDA-MB-231-EGFP cells. Figure 1. Intracellular uptake study. (1) PBS (2) anti-EGFP siRNA (3) Lipofecter and anti-GFP siRNA complex (4) LMWP-PEG and anti-EGFP siRNA mixture (molar ratio: 1:1) (5) LMWP and anti-EGFP siRNA mixture (molar ratio: 1:1), and (6) LMWP-PEG-anti-EGFP siRNA conjugate. (1) PBS, (2) siRNA negative control, (3) anti-EGFP siRNA, (4) Lipofecter and anti-EGFP siRNA complex, (5) LMWP and anti-EGFP siRNA mixture (molar ratio: 1:1), and (6) the LMWP-PEG-anti-EGFP siRNA conjugate. As seen in Figure 1, anti-EGFP siRNA alone cannot penetrate the cells membrane. The fluorescence intensity of LMWP-PEG-RNA inside the cells is very strong, suggesting that the cellular uptake after conjugation with this novel drug delivery system is significant. 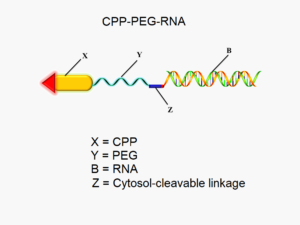 As seen in Figure 2, LMWP-PEG-RNA has a high membrane penetrating ability and significantly inhibits target gene expression. LMWP-PEGs can be employed for gene delivery, and to deliver other drug molecules that cannot penetrate the cell membrane on their own. 1. Zhao, X., et al., Novel Cell-Penetrating Drug Delivery System for siRNA, Poster presentation at 2018 TIDES. 2. Fire, A., et al., Potent and specific genetic interference by double-stranded RNA in Caenorhabditis elegans. Nature. 1998; 391:806-11. 3. Chang, L.C., et al., Low molecular weight protamine (LMWP) as nontoxic heparin/low molecular weight heparin antidote (I): preparation and characterization. AAPS PHARMSCI 2001; 3:7e14. 4. Ye, J., et al., High-Yield Synthesis of Monomeric LMWP(CPP)-siRNA Covalent Conjugate for Effective Cytosolic Delivery of siRNA. Theranostics 2017,7(9):2495-2508.